Home is where the heart is. But how do you conquer that heart when your house is far away from home? During Milan Design Week, hospitality forms the starting point of the second edition of the international design exhibition DesignLanguage. No matter how many languages are spoken, design is one of them, and no matter where we are in the world, the hallmark of the designer is pre-eminently suited to make us feel at home in far away places. Between 17 and 22 April 2018, the group exhibition will show the work of 13 design agencies and brands, and reveals the stratification of design and the diversity of designlanguages through everyday designs. Plastic soup is a growing global problem: this year another 8 billion kilos of plastic waste will enter the world’s waters. Plastic Whale and Vepa Project Furniture decided to stop talking and do something about this. LAMA concept joined the mission, developed the conceptstory and designed the complete collection. Joining forces to turn a problem into a solution: Plastic Whale Circular Furniture High-end office furniture made from Amsterdam Canal Plastic. Opening hours: Tue 17 April – Sun 22 April 2018, 10:00 – 20:00. Sun till 18:00. 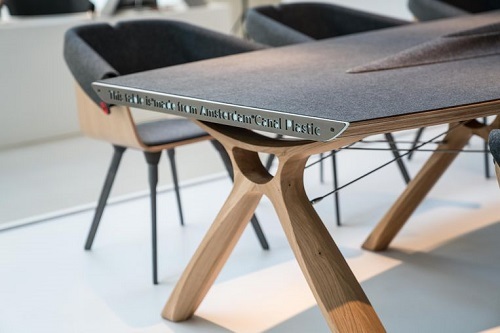 Under the title Human Nature, designing the equilibrium, eleven Dutch designers and brands answer questions about a future in which Humankind and Nature enter into a new relationship. This theme seems to be made for designers from a country that was once under water. The way in which designers see the future says a great deal about Dutch design culture and how it relates to the issues humanity is facing.